The Hoover Platinum Collection Linx Cordless stick is a little more expensive than some stick vacuum cleaners. However, the unit looks fantastic, and performance is good as well. Being cordless, the Hoover LINZ Stick Vac gives you the convenience of portability with the performance of an upright vacuum cleaner. This Stick cleaner is not only cordless, meaning no more plugging and unplugging the power cable as you clean your house, but its also bagless, meaning no more buying expensive replacement bags. On top of that, the Platinum Collection Linx comes with WindTunnel technology (three suction channels), so you know you are going to have a powerful suction, even though its cordless. Speaking of which, the Stick uses an interchangeable 18 volt lithium ion battery, and there is a handy battery “fuel gauge” on the Stick. Motorised brush to agitate the carpet as you are cleaning. This helps life the dirt. Switch to go from hard floor to carpet. Edge cleaning bristles so that you can get close to the baseboards and furniture. Low profile base that means its easier to get under low furniture. So, on paper this Stick looks the business, however, the real proof is in the use, so let’s see what reviewers on Amazon thought of this machine. From the 93 customer reviews on Amazon (at the time of writing this), 60% of reviewers awarded it a maximum 5 out of 5. The average rating of all reviewers is somewhere between 4 and 5 out of 5. Great suction and good for removing pet hair. Ability to turn roller brush on and off. Poor battery performance and long charge times. The Hoover S2200 Flair is a very small, lightweight bagless stick cleaner. 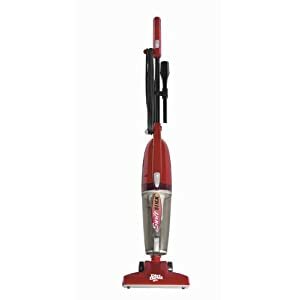 It’s ideal for quickly cleaning bare floors or low carpets. The S2200 Flair has a multi-stage filtration system, and an easy to remove dirt cup. This model has a 20 foot power cord. The Hoover Flair Stick Cleaner is a very slim unit, and has a 6 amp motor. The 10 inch cleaning path means you can cover the floor area quickly, and the dirt is deposited in a bagless dirt bin that can pop off easily to empty. The Hoover Flair Stick has a washable cloth filter as well as a side-mounted filter that cleans the exhaust air. The swivel nozzle design uses large rear casters for maneuverability. There is also a switch to go from bare floors to carpets. 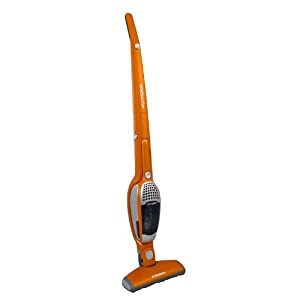 For a quiet, effective Stick vacuum, the Hoover S2200 may be a good option. Let’s have a look and see what S2200 users have to say about this Stick cleaner. On Amazon, there have been 87 reviews of this stick. The average is between 3 and 4 stars out of 5. Excellent performance for such a small cleaner. No metal on the nozzle so there is no need to worry about floors being scratched. In some cases problems were reported about the housing cracking. However, a more recent review on Amazon claims that the problems with the housing has been fixed.